This dinner began with a piece of albacore, which we eat with some regularity. We can buy it fresh at our farmers market and it’s a favorite with everyone. I’m not sure what sent me down the composed salad path, but it might have had something to do with the week of composed salads we ate after Easter and something to do with the fact that I’m tired of the Korean style tuna we’ve been eating–delicious as it is. And it definitely had something to do with the fact that Finn doesn’t often like his foods all mixed up. So if I can separate ingredients without trouble, sometimes I do. For this salad, I made this easy dressing with what I had on hand. 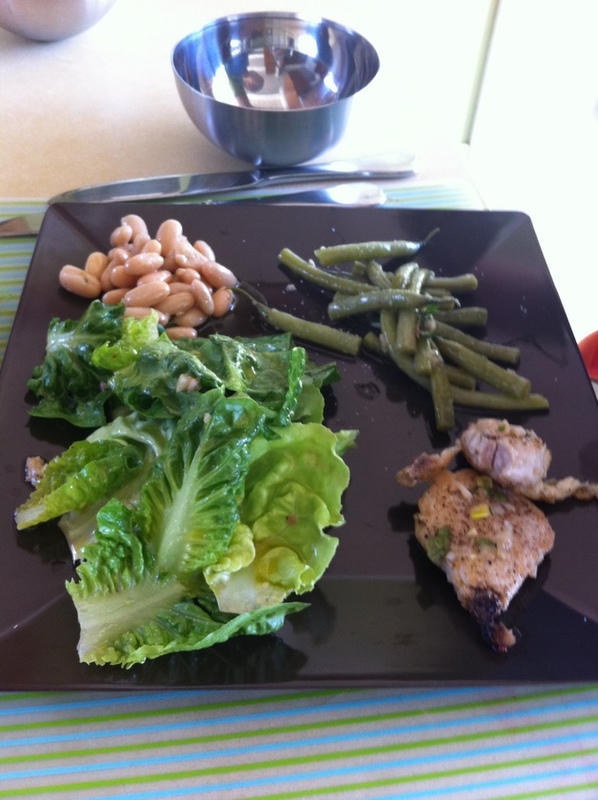 I didn’t have a lot of traditional Nicoise ingredients (potatoes, olives) but I had other things: a tender Boston bibb lettuce and some baby Romaine, hard boiled eggs, tomatoes, white beans, artichokes. I did a quick pan sear of the tuna, roasted the baby artichokes, steamed the green beans. 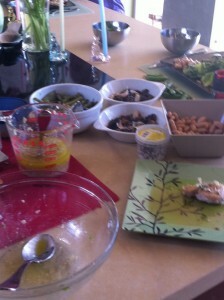 I topped the tuna with the dressing and set out the other ingredients out on the counter with the dressing. 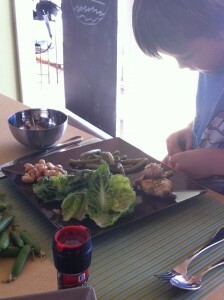 Here’s the very best part: kids get to choose what goes on their plates. I dressed each ingredient individually in the glass bowl, which is the traditional way to prepare a Nicoise in any case, and then set it on their plates. Caroline & I are together on this: when you can give kids choice and control, that’s always a good thing. This was Finn’s custom plate: tuna, white beans, green beans, lettuce. He came back for seconds. I think we also had some fresh bread. The second best part: everything can stay at room temperature so it was ready to go for my husband and I later that evening. In one of those great moments when what makes the kids happy makes the grown up happy, we had a win/win kind of night. And: you can endlessly adapt this: substitute canned tuna or salmon, fresh snap peas or carrots….whatever you have on hand.